The hurricanes that flooded Houston, drenched South Florida, and devastated Puerto Rico and its Caribbean neighbors in 2017 provided a grim reminder of the need to guard against the risk of extreme weather and water damage. Fortunately, wind, rain, and flooding on the scale of a hurricane are rare in the United States. That said, everyday rainstorms and weather fronts can inflict significant damage on homes, office parks, and other structures that have a compromised building envelope. That’s why it’s so important for property owners to test building envelopes for evidence of air and water leaks. The building envelope consists of anything facing the weather or the ground: roofs, windows, exterior walls, basement floors, and first floors. As a top provider of building envelope testing and consulting, CTL Engineering deploys a wealth of tools and talent to help property owners weigh their risks of damage from adverse or extreme weather. Specifications for new or renovated offices, schools, and residences often require water and air-infiltration testing for window systems. These tests probe for weaknesses in vertical and sloped windows, skylights, curtain walls, and odd-shaped windows based on standards developed by the American Architectural Manufacturers Association (AAMA) and the American Society for Testing and Materials (ASTM). Why would you need testing on new windows? This is because manufacturers test sample windows in their laboratories to earn a specific rating, but they can’t always catch mistakes made during manufacturing. Furthermore, delivering, handling, and installing windows can have a major impact on air- and water-tightness. 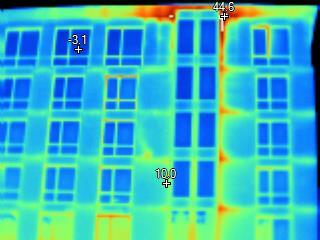 In fact, one-fifth of CTL’s window tests reveal water infiltration issues. Proper window testing can uncover flaws in manufacturing, errors in installation, and construction debris in window weep systems — all of which can pose a risk of significant water damage if undetected. It’s becoming more common for building specs to require evaluations of insulation effectiveness at several stages of construction. These assessments include testing vapor barriers for heat retention and draft prevention. Heat-retention tests should be done during construction to reveal any flaws or leaks while they can still be repaired, especially before the installation of exterior masonry. Once construction is complete, repairs or remediation will be far more expensive. Evaluate a building’s exterior for draft paths and insulation gaps resulting from insulation damage or incorrect installation. Detect problems with roofs and some window-installation issues. Determine the energy efficiency of an existing building. Tracking the source of water leaking through a roof is tough to do without tearing up roofing materials. However, several non-destructive tests such as thermal-imaging and density scans can detect the location of roof leaks. When we discover water leaks, we look for clues on how to plug them. We often do this by extracting roof cores to determine roof composition. Repairs might involve anything from a simple patch to a complete replacement of the roof. If you need a new roof, we can help you evaluate design options and process project-bid documents. Nondestructive roof testing also includes thermal-transfer evaluations to determine the proper installation of roof fixtures and vents. It certainly doesn’t take a hurricane to reveal the threat of water damage to an office or home. Moisture can stain walls, floors, and fixtures; degrade foundations and threaten building integrity; and cause mold and mildew which emit noxious odors and even cause human sickness. Furthermore, improper construction methods that allow water intrusion can trigger costly repairs and litigation. CTL’s decades of engineering experience help building owners stop water intrusion before it does any damage. We also identify sources of leaks to mitigate damage, and we conduct comprehensive testing to provide expert testimony in property-liability cases. Indeed, our experts can help you navigate all your moisture-control challenges.